The Level A practice test is for Grade Kw. Each test contains a full-length practice test with the four test areas found on the NNAT3®q Level A exam. The object of these practice tests is to familiarize your child with the types of questions they will face on test day, how the tests are formatted, and the number of questions in each test area. However, since this practice test has not been standardized with Harcourt Assessment and the actual NNAT3 test, a valid NNAT3 test score cannot be concluded from their results on this practice test. 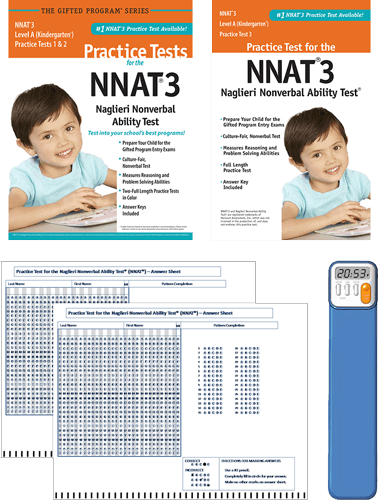 q NNAT3® and Naglieri Nonverbal Ability Test® are registered trademarks of Harcourt Assessment, Inc. which was not involved in the production of, and does not endorse, this practice tests.